Because the co-op is not out to make a profit, anything that does not go to the cost of operating the store will be given back to members as a patronage refund, Hawkins said. The money will be redistributed in proportion to the amount of money customers spend on groceries. The more often a member shops, the more money he or she receives at the end of the year. “It’s like getting your tax refund,” Hawkins said. South Side resident Howie Hawkins has long considered his neighborhood a “food desert” — largely lacking grocery stores that carry fresh produce and other healthy food. But that’s about to change. After years of planning, the Eat To Live Food Cooperative is scheduled to open Oct. 15. It will provide South Side residents a place to buy fresh food locally, said Hawkins, who is secretary of the co-op’s board and the Green Party contender for the 4th District City Council position. A ceremony the morning of opening day will be attended by Syracuse University Chancellor Nancy Cantor, who played an integral role in securing grants for the store’s construction. The co-op, located at 2327 S. Salina St., shares a stretch of road with the South Side Communication Center, which is a meeting space for community organizations and workshops, and with Home HeadQuarters Inc., a not-for-profit organization that rehabilitates city housing. The concept of a food co-op is explained by Shirley Rowser, president of the co-op’s board. The main distinction between a co-op and a typical grocery store is the opportunity to buy a membership that offers benefits for shopping onsite, she said, although a membership is not required to buy from the co-op. The membership program is similar to that of other food co-ops, such as the Syracuse Real Food Co-op located at 618 Kensington Road, about three miles north of the South Side on the outskirts of the SU campus. 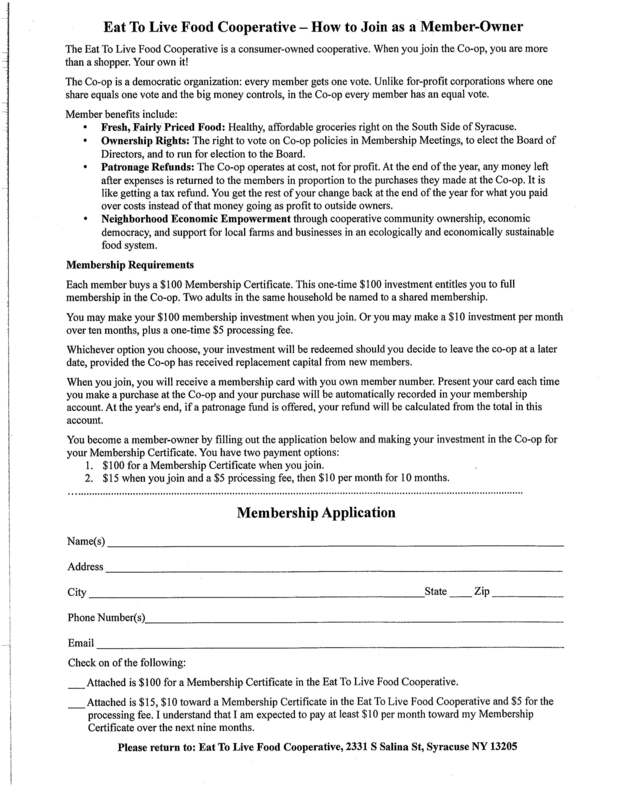 To become a member, customers must pay a $100 equity investment. This is a membership fee, which can be paid in one lump sum or, for a one-time extra $5, through a monthly payment plan, Rowser said. Membership gives shoppers access to occasional discounts, such as “buy one get one free” deals, as well as end-of-year refunds, she said. Because the co-op is not out to make a profit, anything that does not go to the cost of operating the store will be given back to members as a patronage refund, Hawkins said. The money will be redistributed in proportion to the amount of money customers spend on groceries. The more often a member shops, the more money he or she receives at the end of the year. “It’s like getting your tax refund,” Hawkins said. Members also are given a degree of control over the big-picture operations of the co-op, he said. They can vote on issues such as whether to acquire different food products or to adopt policies brought to them by the board or generated by members, he said. And once a year, members will vote for a new board of directors. As the grand opening approaches, the board and management team members are taking care of last-minute business, Rowser said. They are obtaining equipment, gear and food products — mostly vegetables from local farmers — and training the staff. Rowser said there will be eight workers: a general manager, an assistant manager and six staffers to stock the store and operate the cash registers. Scott Pierson, the deli manager at the Syracuse Real Food Co-op, shares one piece of advice for the Eat to Live Food Cooperative staffers as they prepare to open: Cater to shoppers with attentive customer service to bring them back to the store.